I recently heard about this amazing DVD series for military families and had to share it with my readers. You may have already heard about this but if not you'll love this if you have children! It's so hard to explain to children why daddy or mommy have to be gone for so long and I really hope these videos can help your family thru your difficult time. 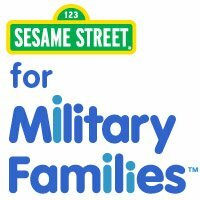 "The Talk, Listen, Connect (TLC) DVD series uses the beloved Sesame Street Muppets to provide support and valuable resources for our troops with children, between the ages of two and five, who are experiencing the affects of deployment, multiple deployments, combat-related injuries and, unfortunately, the loss of a loved one. The USO is dedicated to helping families cope with change and supports Sesame Street’s efforts by offering these DVDs to the troops and their families at many stateside centers. To date, the USO has distributed 45,000 copies of the TLC kits. For more information on the TLC series, please visit http://www.sesamestreet.org/tlc and watch a special message from First Lady Michelle Obama and Dr. Jill Biden. Also, check out the new video "What We Are," starring the Sesame Street gang, which is part of the new "Little Children, Big Challenges" resiliency initiative." DVDs are available through Military OneSource.